I don't feel like taking my 5.x Shadows and Sins into ranked nowadays. I got silver in S7 ranked on my serenity shadow. Looking back, S7 ended with the 5.0 expansion. Back then, merc/mandos were free kills, maras weren't so stronk, and sage/sorc heals were way OP. It's not that Serenity/Hatred was better back then, it's just that now the class balance is heavily tuned toward melee burst and godmode DCD buttons and defensives. So I guess we serenity shadows are fine, but don't ask us to quickly 1v1 a side node anymore. It's considerably more difficult in this meta. May as well go infiltration. Sins are still viable in Ranked. I play Hatred/Serenity less than I used to, but I still play the spec here and there and I can still outplay my opponents, even despite not having Low Slash. In SR 4dps vs 4dps and without too many nets, yes. In TR there is no reason to go Sin when you can have burst classes that deal more damage, have better DCDs and provide better group buffs than a Mass Taunt. The only particularly good thing they left to Sin is Low Slash, that they are probably gonna remove in some future patch seening how they like to nerf this class "just because why not". Maybe I'll pick it up again. I'm kind of bored of my other classes/specs. Welcome back, Krea. I enjoy your guides and vids. I believe he's quoting a frequent contributor to these forums. His name is Strawman. Please check the videos in my post above yours, think you may find them interesting. I think our force management was way better in classic SWTOR. Sadly, however, I don't think they could ever go back to that system. If they did we'd have far too much force regen. 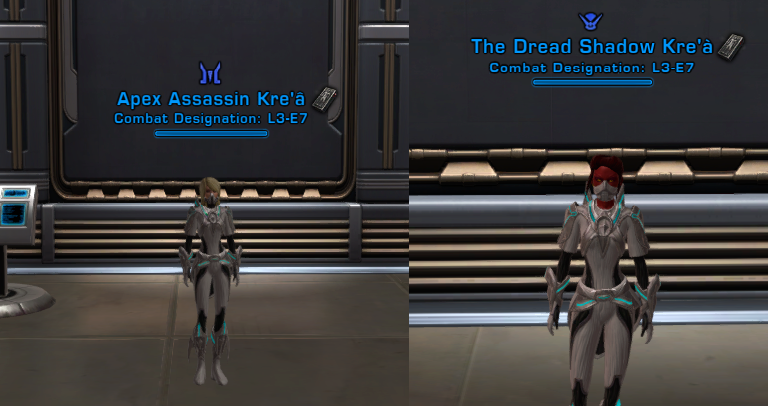 That spec as a whole was much better in classic SWTOR than it is now. Hatred sins need buff on their defence and force managment. Agreed. While it's an unpopular opinion, I don't like the dot-spreading. I especially don't like how it caused us to receive a nerf to our self-healing. If we want to get any relevant self-healing we pretty much have to dot the entire enemy team. I'm not immune to the charms of scoreboardwh*ring, but it feels cheap to do so as a Madness Assassin/Serenity Shadow. Spec had way more elegance in the original game. I would like it if they moved the DoT spread back to Death Field. Death Field should be centered on self, similar to how Vigilant Thrust works for Guardians. What's the radius of Death Field? 10m? Once upon a time, Serenity/Hatred's role was to control grouped melee opponents with nasty dot spreads and an aoe taunt in pvp. 4m whirling blow dot spread doesn't quite cut it, imo. I knew I wasn't crazy. I remember the dot spread was on death field. Sad that changed. Don't make me gouge you with my purple origami horns. Hatred is simply NOT an assassin. It has nothing to do with the concept of stealth and assassination. It's a melee Madness.